It's Muffin Tin Monday but we didn't make tins this week. We did, however, make some really easy muffins. This recipe comes together so quickly that you can easily throw them together in a morning. Pierce loves them, and we've even taken them to his preschool for a mid-morning snack. In large bowl combine pancake mix and sugar. In another bowl whisk egg, water, and oil. Stir into dry ingredients until just moistened. Fold in blueberries. Fill paper lined muffin cups 2/3 full. Bake at 400* for 14-16 minutes or until toothpick comes out clean. Cool 5 minutes before removing to wire rack. 1 muffin = 173 calories, 6 grams fat, 3 grams protein. Recipe is from Taste of Home last May 2010. If you haven't entered my giveaway yet, be sure to check it out here! These look so yummy! We are inhaling blueberres at our house right now. 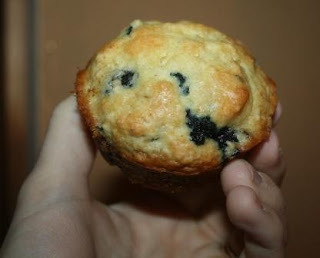 Great, now I'm sitting here at work drooling and craving blueberry muffins... They look AWESOME! I LOVE blueberry muffins. This recipe looks easy, which makes it even better. I'm going to have to try these! I love Taste of Home recipes! I found a hard cover book of them at the library a few years ago on the shelf of books they were selling. I bought it and have made a lot of the yummy recipes in it. My kids love blueberries! Hope I can find some at the store next time I go! Those are easy! Now I really really really want a blueberry muffin! These look delicious. I haven't made blueberry muffins in years. For shame! Those sound so yummy and simple! Thanks for sharing it! I love me some blueberry muffins! I most defnitely will be stealing this recipe. Thanks!! !